The Goodman GPH1524M41 is a complete packaged heat pump unit with heating and cooling capabilities. The air conditioning of this model uses a high-efficiency compressor and the chlorine-free R-410A refrigerant to effectively cool the home. It has a 2 ton and 24,000 BTU cooling capacity. The GPH15M line's heat pump system uses a 23,400 BTU heat pump compressor to warm the home. The GPH15M packaged heat pumps have variable electric heat capabilities. This particular model offers 5, 8 and 10 kW electric heat options. Goodman's packaged units are designed to be incredibly energy efficient. This model offers 15.0 SEER and 12.0 EER ratings, as well as an 8.0 HSPF (heating seasonal performance factor) heat pump efficiency. These contribute significantly to home heating and cooling costs, especially when compared to systems with less efficient ratings. Plus, with the GPH15M line, the heat pump system is coated to resist corrosion in addition to its durable louvered condenser coil protection, ensuring a long lifetime for this packaged gas/electric unit. 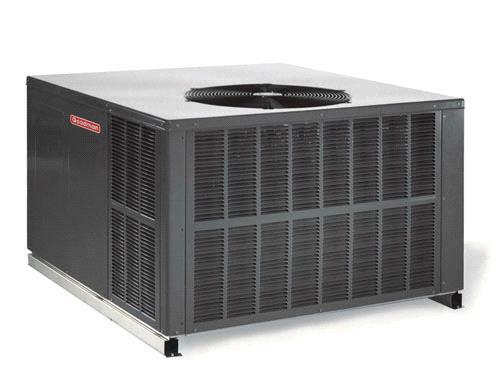 This Goodman heat pump and air conditioner makes use of very durable copper tubing and aluminum fin coils. The benefit of a packaged unit is that it comes fully complete and self-contained, housed in a heavy-gauge galvanized-steel cabinet with an architectural gray powder-paint finish. This high-efficiency model has an internal relief valve for extra safety. It has convertible airflow horizontal or downflow set-up possibilities.